Western Digital has revealed new hard drives and SSDs aimed at the enterprise, including a new fourth-generation helium drive which offers the biggest capacity available in the HDD world, and a super-speedy solid-state drive. 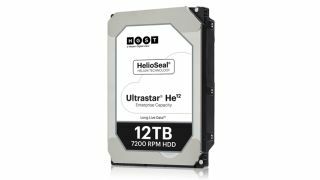 The Ultrastar He12 is helium-based 3.5-inch hard disk which uses PMR technology and notches up 12TB in capacity, coming in either SATA or SAS flavours. With the future of storage in the cloud, is it time to buy a Chromebook? It utilises the world’s first eight-disk design, the company notes, and offers plenty in the reliability stakes as well, with a five-year warranty and a MTBF (mean time between failures) rating which tips in at 2.5 million hours. And it boasts the lowest power profile in the industry, according to Western Digital. The drive is sampling to OEMs now, and is expected to be commercially available in the first half of 2017. Seagate does also have its own 12TB helium hard disk in the pipeline, and currently sampling, but Western Digital is planning to stay a step ahead with a 14TB SMR flavour of its helium drive currently being tested with customers and expected to emerge in the middle of next year. In the next couple of years, we can expect helium drives to push up to the 20TB mark. On the SSD front, another new offering is the HGST Ultrastar SN200 which is an NVMe PCIe solid-state drive offering capacities of up to 7.68TB, and random read performance of up to 1.2 million IOPS in ‘key workloads’. WD also unveiled the Ultrastar SS200 SSD enterprise-class SAS drive which will also be available in capacities of up to 7.68TB, and offers up to 1800MB/s sequential read performance, and 1000MB/s writes. It’s designed for data-intensive operations and cloud-based platforms. While these might be enterprise offerings, as ever, we can expect trickle-down benefits in terms of consumer drives from the heavyweight technology which is pushing these HDDs and SSDs forwards. Along with all these drives, an announcement was also made about 3D NAND technology being used in SanDisk Edge microSD cards, with a new card currently shipping to OEMs which has capacities of up to 256GB and is designed for use in the likes of dashboard cams or drones. It’s capable of storing almost 60 hours of Full HD video footage.